A fixed annuity is a contract between you and an insurance company. You pay the insurance company, through an agent, a premium that grows tax deferred over time by an interest rate determined by the contract. At some specified point in time you receive regular payments from the insurance company. Fixed annuities offer many benefits to the holder. The most important being that the principal and accrued interest are 100% protected and guaranteed by the insurance company. (1) Depending on how the annuities are structured they also can provide benefits beyond guaranteed periodic payouts including emergency funds when necessary, death benefits, nursing home benefits, and lifetime income benefits, meaning the holder will never outlive the income provided by the annuity. There are two types of fixed annuities, a traditional fixed annuity and a fixed index annuity. The primary difference between the two is how compound interest grows the premium over time. In a traditional fixed annuity, generally just called a fixed annuity, an interest rate is specified in the policy. This rate remains fixed for a specified period of time. The initial interest rate is determined by prevailing fixed income rates that would be typical for CDs or government bonds. After the specified time period the insurance company may change the interest rate to match current rates but it would never be below a minimum rate specified in the policy. A Fixed Index Annuity is a more recent addition to the annuity family that allows the annuity holder to have all of the benefits of a fixed annuity while also sharing in stock market gains. A fixed index annuity protects both principal and any accrued earnings against stock market losses. This is accomplished by setting the annuity interest rate based on a percentage of stock market growth while still guaranteeing a minimum positive interest rate if the market loses value. For a more in-depth look at the various types of annuities and the pros and cons of each, please sign up for instant access to our free 6-part video series titled, “Securing Your Retirement Future“. The only significant difference between the two types is that the interest rate in a fixed index annuity is determined by the gain in the underlying stock index whereas in a fixed annuity the interest paid is based on the prevailing interest rates for fixed income investments like CDs. To see how this difference in interest rates might have affected the performance of the two types of annuities, consider first the history of fixed income interest rates from 1984 to 2012 as shown below for 6 month, 1 year and five year CDs. Clearly an investment whose return is based on one year CD rates or other typical government bond rates has been one of decreasing performance for almost thirty years. For the purpose of comparing the two types of fixed annuities, assume the insurance company would readjust the interest rate every year as the underlying basis for the rates decreased. 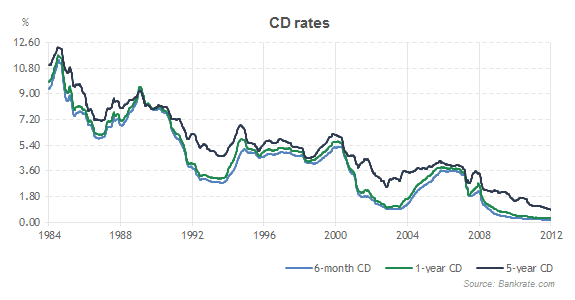 Then as the one year CDs decreased from about 10% to less than 1%, the applied interest rate would also decrease, averaging 3.9% per year over the 29 years. The performance of the S&P 500 by contrast has not had a downward trend, averaging about 12% gain per year from 1984 to the present. In that time period there were only 5 years with negative gains. The positive gains for the other 24 years averaged 18.1% per year. It is necessary to understand a little more about fixed index annuities to determine what might be the applied average interest rate over this period. There is a maximum rate that can be applied, called a cap rate, specified in the policy. There is also a participation rate which is a percentage of the gain of the index that is applied to the annuity rate. To evaluate how a fixed index annuity based on the S&P500 index would have performed over this same period assume a typical value of 50% for the participation rate and a cap rate of 8%. There were 5 years where the index gain was less than zero so a minimum rate specified in the policy of about 1-3% was applied during those years. In thirteen of the remaining 24 years the index gain was greater than 16%. After applying the participation rate, the gain was greater than the cap rate so the cap rate of 8% was applied. For the eleven years where the gain was less than 16%, after applying the participation rate the average applied annual interest rate was 3.9%. The average annual rate for the 29 years was 5.4% per year, which is a 40% improvement in the average yearly interest rate over a comparable fixed annuity based on CD rates. If the time period was reduced to say the last 10 years the difference between the performance of the fixed index annuity and the fixed annuity would be considerably greater. The chart shows that today is the least desirable time in the last 29 years to purchase a fixed annuity given that fixed income rates like government bonds and CDs are at historic low levels with no indication they will return to historic average levels anytime soon. In contrast the gain in the S&P500 was 16% in 2012 meaning interest would be applied at the cap rate for that year. While future performance cannot be predicted by past performance, anyone considering purchasing an annuity for future income would be wise to consider a fixed index annuity because of the potential to maximize lifetime returns by sharing in future stock market gains while being protected from losses. As you can see there are many ways to structure an annuity to satisfy individual requirements and there are differences among the various annuity types not covered here. An excellent way to learn more about guaranteed lifetime income offered by an annuity is to watch our free 8-part video series “Securing Your Retirement Future“.